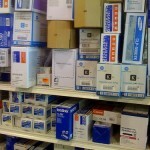 Toner cartridges: 32°F – 95°F (humidity no more than 85°F). On the same note, it is important that the storage location is dry and dark. Make sure each box is stored upright and avoid stacking them too high. Do not shake or bump the cartridges as it could loosen the shipping seal and cause a leak. Do not remove the cartridge from the packing it was shipped in until it is being installed. The protective bag and bubble wrap will eliminate the possibility of the cartridge being damaged while on the shelf as well as protecting it from the elements such as air and moisture. Though buying in bulk is recommended for optimal discounts, it is not advised to order excessively more than what the needs of the office calls for. 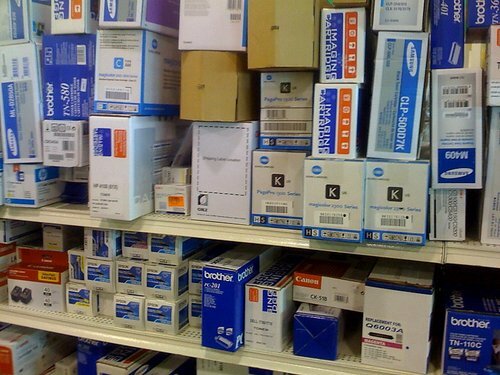 Overbuying could force cartridges to be on the shelf for more than 2 years, which opens up the door for malfunction and most likely voids the warranty. These are some simple steps that can be taken by the end user to ensure longevity of shelf life for toner and ink cartridges, new and refurbished. Of course, some of this responsibility lies within the manufacturer and how long the cartridges have been kept on their shelves. That is why it is important to read and understand the warranty that is offered with your cartridges. Hp website claims their is no expiration on Toner just ink. http://h20000.www2.hp.com/bizsupport/TechSupport/Document.jsp?&objectID=c01848047. The only thing that makes a toner cartridge go bad is leaving it in hot weather possibly anything over 95 F. Toner is a powder thus it can’t dry up it only melts so if it to hot the toner will melt together in clumps making the toner bad. Toner cartridges generally have a longer shelf life than ink cartrdiges, but heat isn’t the only factor that can affect them. Moisture can also cause problems, which is why it is important to keep cartridges in a dry space and in the original packaging until they are to be used.